Rising consumer consciousness along with increasing natural supplements demand may stimulate food minerals industry growth. These are manufactured for curing various health issues such as bone health, hormones, immune system, digestion support, allergy relief, adrenal & thyroid support, cough & cold eye health, and heart health. Natural food-based minerals are utilized across various industries owing to anti-oxidation, anti-inflammation, insulin, cortisol and adrenaline regulating properties. Zinc food minerals market size may expect consumption may exceed 15 kilo tons by the end of forecast period. Increasing cases of depression & anxiety owing to hectic schedules & improper diet will boost the market for zinc mineral supplements owing to cortisol and adrenaline regulating characteristics. Zinc is found in hippocampus & plays a crucial role in regulating several brain functions as it pairs with vitamin B6 to aid in proper function of neurotransmitters thereby stimulating market growth under brain support natural mineral supplements. Magnesium food minerals market size may witness gains at above 5% by the end of forecast period. It is an essential biological component as its ions are responsible for activating the energy chemical adenosine triphosphate. It also helps in the regulation of sodium and potassium levels. The market share for magnesium mineral supplement will increase owing to its use in treating problems like insomnia, asthma, high blood pressure, diabetes, and constipation problems. 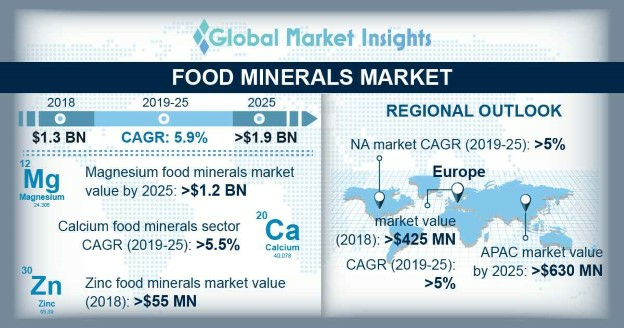 Calcium food minerals market demand may surpass USD 320 million by the end of forecast period. Rising cases of bone diseases such as osteomyelitis and osteoporosis will boost the market for calcium mineral supplements. It plays an important role & is necessary for the healthy functioning of cells, bones, muscles, and nerves. Europe food minerals market size may witness gains at above 5% by the end of 2025. Rise in elderly population, increased alcohol intake, and busy schedules will boost the market for natural mineral supplements. They regulate several metabolic functions & act as catalysts for enzymes. The market share will rise as they regulate nervous system and producing energy. It also helps in proper functioning of organs, muscles, and tissues which may further stimulate food minerals market. China food minerals market demand may register significant gains at over 5.5% by the end of 2025. Phosphorus is an important component of bones and helps in regulating basic metabolic functions. It also helps in maintaining essential functioning of brain, heart, kidney, and blood. The market share will rise owing to rising cases of tuberculosis and influenza. Phosphorus also aids in digestion, helps reduce weakness & fatigue, and reduces the risk of arthritis. Germany food minerals market was valued at over USD 90 million in 2018. Rising cases of eye diseases such as cataracts, glaucoma, dry eyes, low vision, and age-related macular degeneration will boost the market share for iron based food minerals. Iron supplements are widely used to improve neurological & cognitive functions, reduces the risk of heart failure, and high blood pressure. Major industry participants in food mineral industry consists of Bayer, Thorne Research, Solgar, Bee Health, Youngevity, Novartis, and Pharmaca. The companies are engaged in research & clinical trials across the world to develop new products and customer base to enhance regional reach with may further promote food minerals market growth.